Welcome to the Zwift L'Etape du Tour de France Training Club. Phase One focuses on building endurance and aerobic efficiency. How long can you ride? How many miles can you rack up before your lungs and legs feel the burn? Through traditional long slow distance training as well as structured HIIT—High-Intensity Interval Training—we’ll push your aerobic fitness until it levels up. 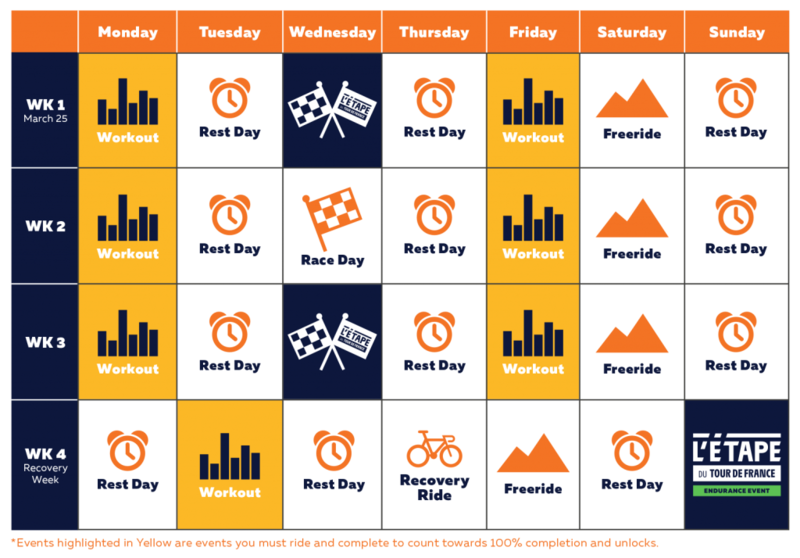 In Early Base, you’ll complete two structured Zwift workouts each week. Our aim here is strength and endurance. Your sessions will involve both high-crank torque workouts and high-intensity intervals to increase oxygen uptake. Track and fine-tune the details of your progress. Zero in on problem areas. Rinse and repeat. While structured workouts are the foundation of this training plan, they’re not all we’re offering. The Early Base training phase also includes a free-ride session meant to prepare you for L’Etape du Tour de France’s many meters of climbing. Zwift provides a wide range of climbs. Some last five minutes. Some take over an hour. Every week, we’ll suggest a free-ride route with lots of climbing. It may be tough at first, but push through. It’ll be worth it, we promise. Other unstructured portions of the Early Base phase come from Zwift endurance events and racing. Perfect for challenging your limits week after week, these unstructured efforts allow you to train high-intensity intervals while measuring real improvement. All that’s left is to get on Zwift and put in the work. Workouts highlighted in Yellow must be completed to count towards 100% completion and to receive unlocks. These workouts can be found in the workouts dropdown in Zwift once you have enrolled in the training club. You will receive progress emails in 25% increments once all Phase 1 workouts have been completed from start to finish. Strength endurance intervals on the bike focus on high-crank torque sessions (low-intensity, low RPM). High power and low cadence is key. With the target power below your FTP, this allows for more extended efforts than usual. Ride Watopia’s Mountain 8 route. Focus on sustained climbing power up the Epic KOM. During the Early Base training period, it's fine to spend time at intensities above your threshold. The key lies in the duration spent above threshold. By completing short intervals above threshold you’ll accumulate more time in this area than longer single session. Today’s session will give you eight minutes in Zone 5. Short recovery periods also increase oxygen uptake, particularly towards the end of the set. More high-crank torque intervals. This time, however, we’re increasing the power during the intervals, while maintaining the same cadence. This also includes some Zone 2 aerobic work with short high-cadence surges. One of the goals of this training phase is to increase mitochondrial density. Put simply, these are the muscles’ power stations. Recent studies show that the right amount of HIIT can provide the same benefits as much longer workouts done as traditional long slow distance training. More high-crank torque intervals. Aim for even more power while maintaining the same cadence. Ride the “Big Loop” course on Zwift. This loop starts with the Epic KOM climb and is followed by the Jungle loop and Volcano Climb. Make sure to save enough energy over the first climb to be even stronger for the final climb. It’s important to give yourself enough recovery throughout your training. Today’s session is light but structured. After the warm-up, you’ll go on a free ride but will be prompted to perform three one-minute intervals throughout. Choose a course with a low amount of elevation gain. Less than 305m // 1,000ft. STILL NEED TO ENROLL IN THE TRAINING CLUB? HERE'S HOW. I have a Zwift account: Select the "Enroll Here" button below. Below the "Create An Account" form select "Back to Login". On the next page, enter your Zwift log in details and select "Log In". This will take you to your My Zwift dashboard. That means we captured your enrollment into the club. You can expect an email to follow with more details. Workouts will become available in the workouts section on Zwift automatically by March 25. I don't have a Zwift account: Select the "Enroll Here" button below and follow on-screen instructions to create a Zwift account. You will automatically be enrolled to the club upon account creation. You can expect an email to follow with more details. Workouts will become available in the workouts section on Zwift automatically by March 25.